Once a user has signed in, your application can use Akamai's RESTful API to access user profile data. Social Login authenticates a user and returns social data. It is up to your application to determine a user’s logged-in state, as well as store the returned data. For a solution that includes storing the user data, see the Registration Overview. 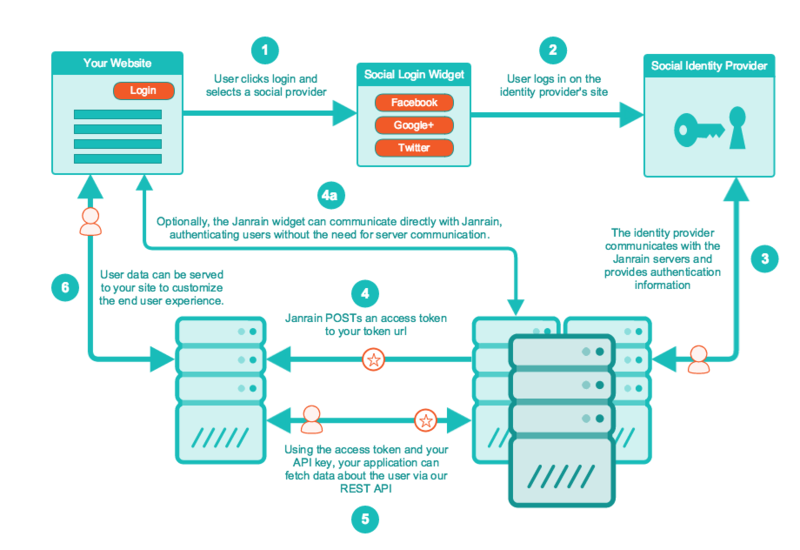 The following diagram shows how a user signs in to your website using Akamai Social Login. For more information on Social Login configuration options, see Implementing Social Login. User clicks login and chooses a social provider through which to authenticate. The Social Login widget supports both modal and embedded presentation modes. User logs in on the selected identity provider’s site (for example, Facebook, Twitter, and so on) and approves the use of your application with their account. The Social Login widget supports both popup window and redirect-based login flows. The social provider communicates with the Akamai servers and securely provides authentication and identity information. The type and amount of data provided depend on the provider being used. For more information, see User Profile Data by Provider. Akamai posts an access token to your token URL. Using the access token and your API key, your application can fetch data about the user through our Social Login REST API. User data can be served to your site to customize the end-user experience. The Social Login Dashboard provides a central location from which to administer the features of Social Login. 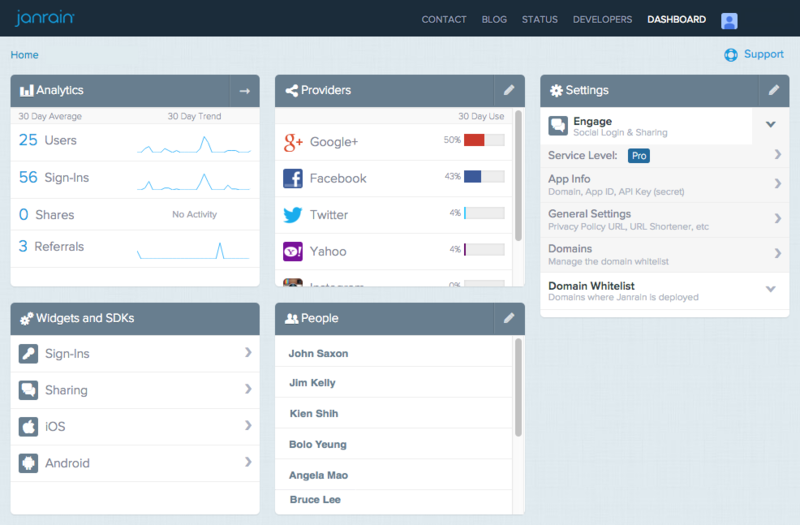 Each Social Login application listed as a property on the Dashboard home page has its own unique configuration page, similar to the one shown here. This page consists of the following sections, which provide high-level information about the application and access to more detailed information as well as the application configuration UI. Analytics — Shows 30-day averages and trend graphs for the application. Click any of the categories or the arrow at the top right of the Analytics box to display a detailed view of the corresponding data. For more information, see Social Login Analytics. Providers — Lists the identity providers configured for the application and shows the percentage of users who signed in with each provider. When you hover over a provider, click the wrench icon to configure the provider settings. See the Provider Setup Guides for specific setup instructions. Settings — Provides access to the Application Settings page, where you can set up your domain whitelist, access your application domain and API credentials, and manage other aspects of your Social Login application. Widgets and SDKs — Provides links to the configuration UI for Social Login and Social Sharing and resources for using the Social Login iOS and Android SDKs. For information on configuring through this UI, see Design the UI with the Dashboard. People — Lists the administrators in your organization who have access to the application. Click the pencil icon at the top right of the card to send invitations (valid for three days) to additional email addresses or remove people who currently have access.